Illinois – a scenic beauty often overlooked by many in search of the perfect vacation spot or spa resort. However, the truth of the matter is Illinois reveals a far more obscure exquisiteness only to be recognized by those few that have experienced it for themselves. Among the crowd of those that choose to abscond to Illinois, if only for a short while, is the group of participants of the extreme sport known as skydiving. Of these, three have dominated the market. often described as a small drop zone with the perks of the big ones, is one of the few facilities that offer tandem, AFF, and static line jumping in Illinois. Although it does not provide many of the commercial amenities, such as pools and bars, Archway focuses on perfection in simplicity. The center also providing no commercial amenities, offers tandem and AFF jumping.The only possible shortcoming is the lack of static line jumping, for those enthusiast that enjoy that aspect if the sport.For the most part, Chicagoland is revered and respected as one of the top drop zones in Illinois. The center provides the exceptional amenities many have become to expect from a drop zone or any hotel, for that matter.With a pool, bar, and restaurant on the premises, it seems of second significance to note this facility offers only tandem and AFF jumping.Although criticized by many, these additional perks are greatly enjoyed by guests and jumpers that choose to make Skydive Chicago their home, even if for a short time. The serene plains of the Illinois grassland; the uninterrupted nature of scenic beauty; the stillness of the chaotic wildlife just beyond reach – Illinois ( http://www.illinois.gov )provides a serenity like no other. Perhaps it is man’s nature to combine the contradictory. With that in mind, many enthusiasts take to the sky to interrupt the tranquility of the Illinois scenery, or possibly to partake in it at an unprecedented level – 10,000 feet above the ground. Whether you live in the Chicago area or not, skydiving is an exciting way to spend the day; not only will you overcome fear, you will have a great time too. 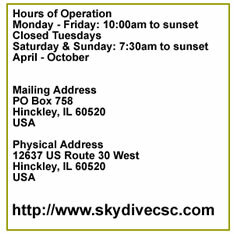 Chicago skydiving facilities afford the best in instruction, equipment and jump sites to their customers. Parachutists have several companies vying for their attention which means better service, better sites, and cheaper rates than anywhere else in the United States. Many Skydiving companies established near Chicago are within 100 miles of the city and have a range of services for beginners to advanced jumpers. If you are interested in tandem skydiving, the Chicago area is your oasis. Several companies offer tandem jumps and even pictures of your parachuting adventure.That way you have proof of your skydive as well as an indelible reminder of your jump. There are several Chicago parachuting facilities which have a wide variety of activities besides the traditional amenities of lessons, instruction, certification, equipment sales and aircraft rental. In fact, if you would like to plan a recreational vacation centering on your skydiving hobby, there are a number of parachute jumping companies which offer all inclusive facilities for camping guests. …is less than an hour away from downtown Chicago and is located on US Route 30 just west of Naperville, Illinois. This complete skydiving facility has everything a parachutist could want – friendly and professional staff, licensed instruction, climate controlled packing area, classrooms, washrooms and showers, turbine aircraft, café, proshop and campground complex. is about 75 miles from Chicago situated along the Fox River and was designed as a skydiving and recreation area. Not only are there world-class skydiving instruction, training and jumps; there is a huge 22,000 sq ft recreation complex, campgrounds, game area, horseback riding, canoeing and even hiking and biking trails. 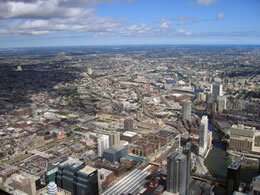 The Chicago area itself is exceptional in scenery and landscape which is breathtaking to behold from the sky. Not only will you remember your parachuting, you will remember the view from 10,000 feet and the majesty of Mother Nature. Copyright © 2019 · Sport Websites.